Hide questions, formula challenge, and more, in this week's Excel news. Visit my Excel website for more tips, tutorials and videos, and check the index for past issues of this newsletter. When you're creating an Excel workbook, do you ever want to hide some of the information temporarily? 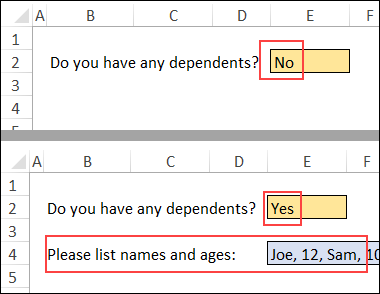 In the past, I've built complex questionnaires in Excel, and some of the questions had a follow-up item, based on the first answer. To keep things from looking cluttered, only the first question was visible. The follow-up item was in white font with white fill. For example, "Do you have dependents?" Select No, and nothing happens. Select Yes, and the next question appears. Cells B4 and E4 have a simple conditional formatting rule: =E2="Yes"
The conditional format for B4 adds a black font, and E4 adds blue fill and a border. For step-by-step video and written instructions, see my Hidden Questions blog post. And yes, the video shows a merged cell, but that's what my client wanted! See more examples on the Conditional Formatting Examples page on my Contextures website. Join Mynda Treacy for a free one-hour webinar, and learn how to build interactive dashboards in Excel, with or without Power Query. The live webinars are only available until Thursday, Feb. 7th, so click here to register today. 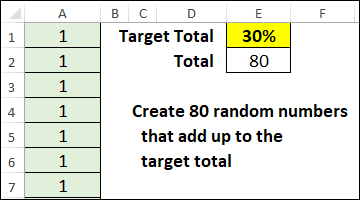 Last week, someone asked how to create a list of 80 random numbers that added up to 30%. My first thought was to use the Solver add-in, but it couldn't find a solution without using lots of zeros. My solution is below the screen shot, and I know you're creative, so send me an email, to let me know how you solved it. Click here to get the sample file with the challenge and my solution. To create random numbers that total 30%, I used this formula from Stackflow, in B1:B80. It divides the random number (A2), by the column A total (E2), then multiplies by the target (E1). In cell E3, this formulas gets the B total: =SUM(B1:B80). It wasn't exactly 30%, so I pressed F9 several times, to get as close to 30% as possible. When you're happy with the results, copy B1:B80, and Paste as Values, to save them as numbers. If you have a copy of my Data Entry Popup kit (DVMSP), there's a new version (6.13). Use your original download link to get the latest version. Here are a few Excel articles that you might find useful or interesting. 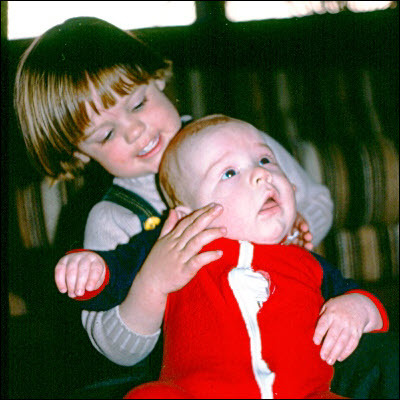 The article about Lotus 1-2-3 versus Excel made me think of sibling rivalry. Tomorrow is my son's birthday, and his older sister was "delighted" when he arrived, as you can see in the photo below. (She claims it was a hug.) We call this picture, "Don't fight it! ", because Jack Bauer said that to his victims in the TV series, 24.